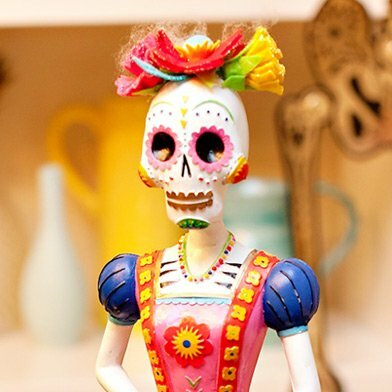 Well, it’s Thursday morning… and I can’t believe I’m saying this already but the Hip Hostess Halloween event is TONIGHT! We started setting up yesterday, and I have to say that venue (The Apartment) is just as amazing in person as it looks online…there’s even a walk-in “cooler bar” where we’ll be serving up a special drink! 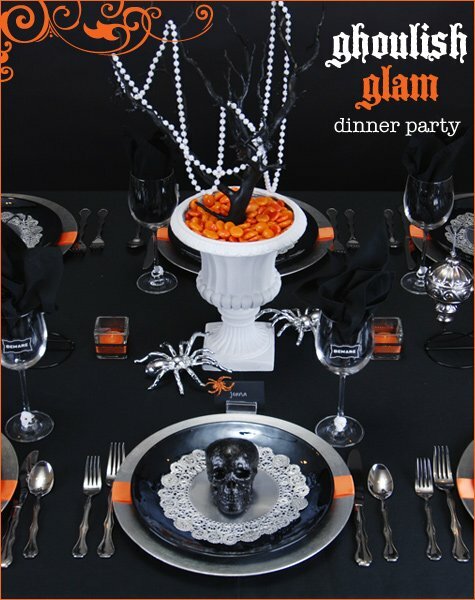 In keeping with the flapper era-inspired foundation of this Halloween party theme, the focus of the tablescape design is vintage-inspired elements with shimmery spider & skull details, and the color palette is primarily black & silver with splashes of white and vibrant orange. 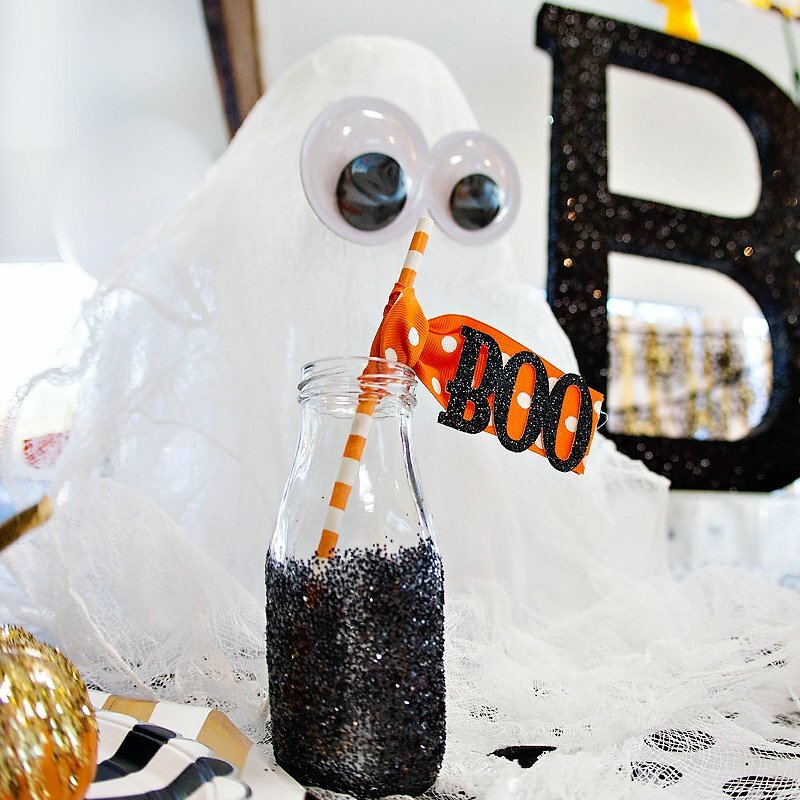 • The table centerpiece features spray-painted Sierra Manzanita ($6.99 at save-on-crafts.com), flapper costume beads, and glittery spiders. (Scroll down to the bottom of this post for step-by-step “how-to” details.) 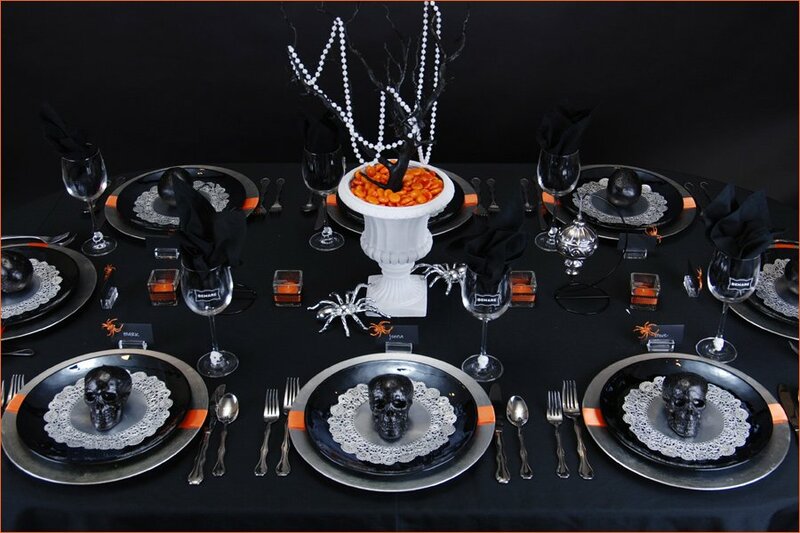 Fill the table space around the centerpiece with vintage or gothic-themed Christmas ornaments and votive holders embellished with black & orange ribbon. 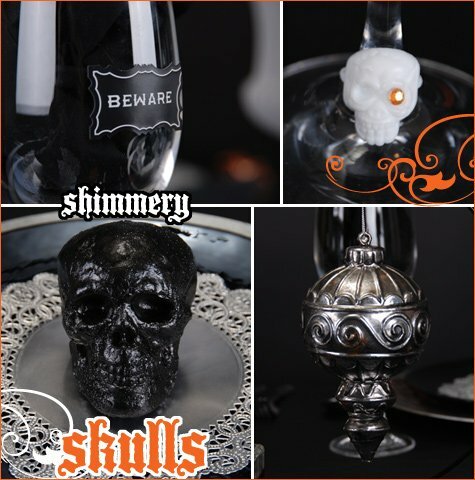 • Dress up wine glasses with “skull stem charms” made from plastic skull rings and adhesive rhinestones, and Halloween-themed stickers like Martha Stewart’s “Beware” labels pictured here. 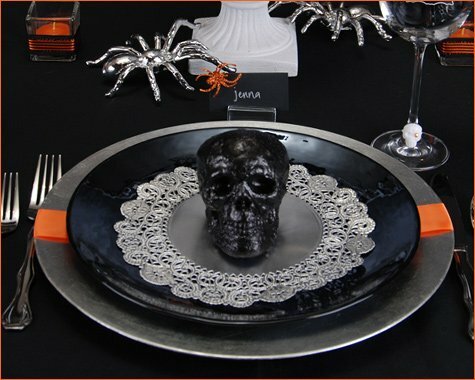 • For place settings, you’ll need silver charger plates ($12.60 for 6 at save-on-crafts.com), black dinner plates, 8″ silver foil cake liners, ribbon, and foam skulls. Wrap a band of orange ribbon around the charger plate for a small pop of color, then layer the rest of the elements on top. I created the shimmery black skulls pictured here using unfinished foam skulls from Michael’s ($1.49 each), black spray paint, and black craft glitter. 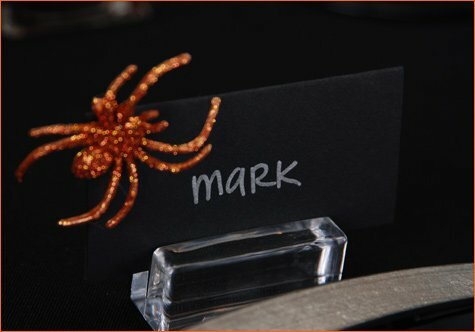 • Embellish place cards with glittery orange spiders, created by snipping the “ring” portion off of orange plastic spider rings, then decorating the spider portion with orange craft glitter. 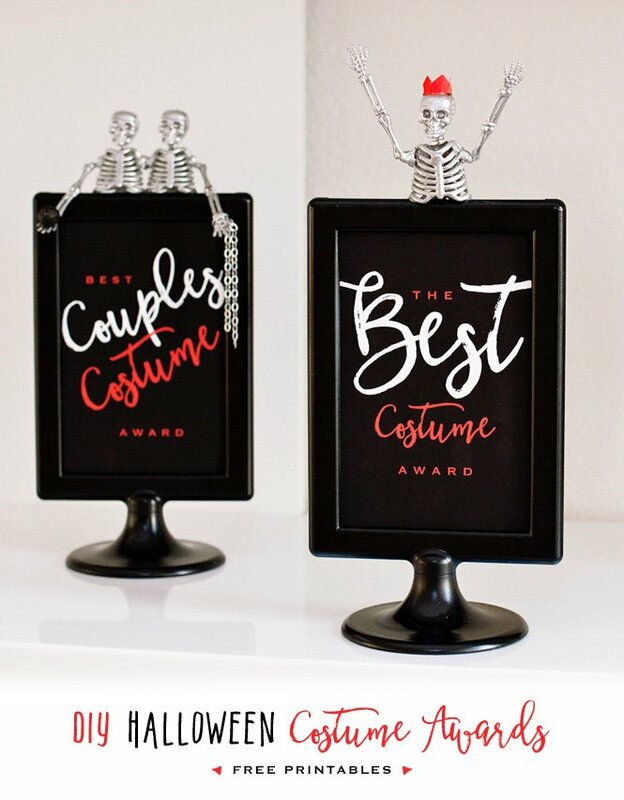 Also pictured below: Clear Placecard Holders and Black Placecards from *Social Couture. Here’s a shot of the entire tablescape…click on the image to view it at a larger size. For tonight’s party, we’ll be setting this up on a white lacquer table instead of a black tablecloth, so I’ll post some shots of that version later! 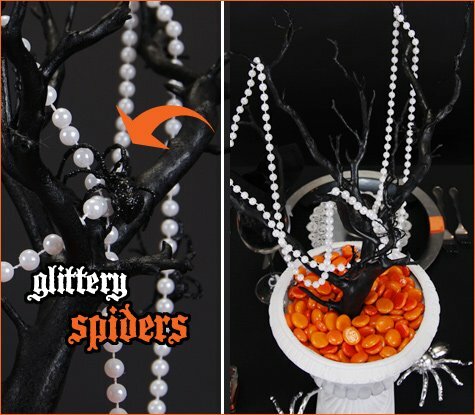 Drape a strand of white costume beads around the branch, and finish with a few glittery black spiders crawling on the branches and beads. 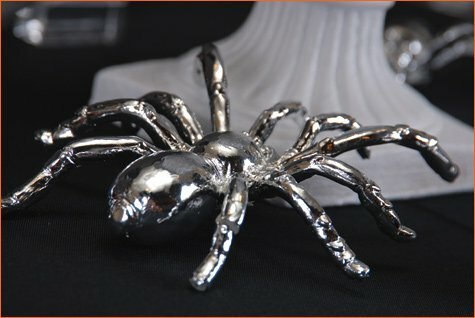 The spiders pictured here are from Z Gallerie, but you can also create your own using any type of plastic or toy spider, black spray paint, and black glitter! *Get 10% off any Social Couture order with promo code “HWTM “! This table is so freaking cool! 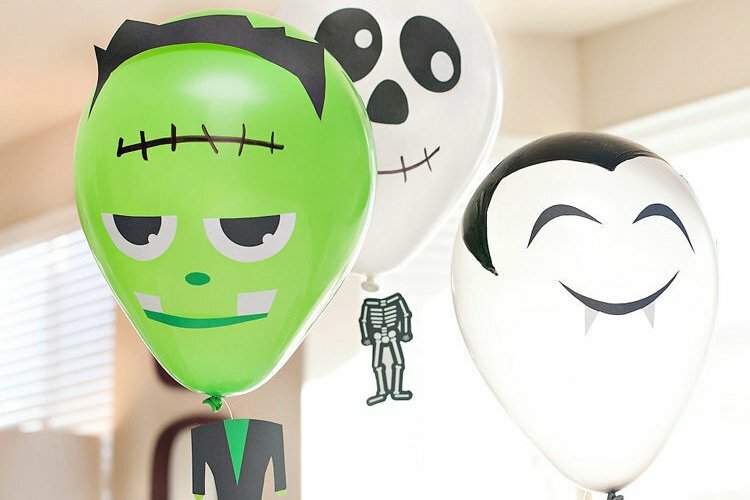 I love the foil cake liners idea – and the silver skulls are fantastic! Everything looks fantastic, Jenn! Good luck tonight! L-O-V-E it! i love the use of the manzanita branch. 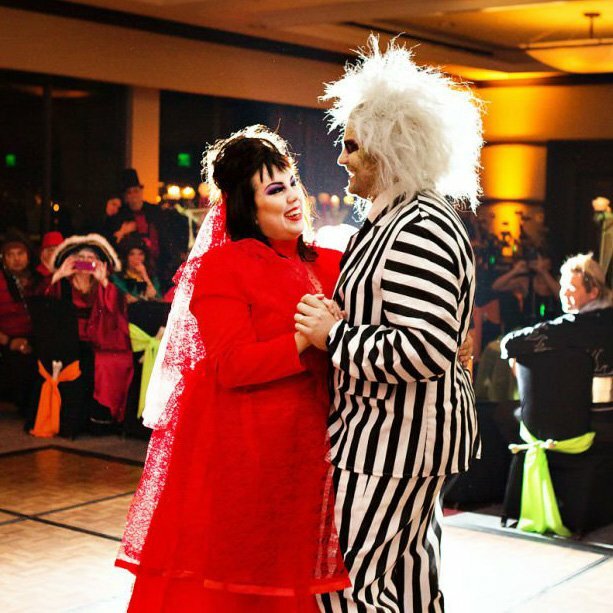 can’t halloween be everyday?! ;) have fun tonight! Hi Jenn! It was great meeting you last night! My friends and I had a blast! 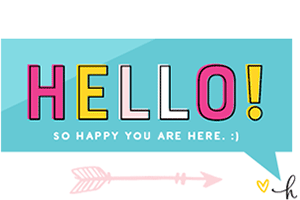 They are all sold and went to check out the blog today :) I have more questions so feel free to email me: [email protected]! I love this idea! I decided to be a flapper for this Halloween so this party theme would work best with my outfit! this sounds awesome! to bad i cant get the stuff.